Scotland is a country part in this General Election. The issues that matter there are very different from those that matter in a England, on account of the push for independence and also the devolution of control over their education and health systems, meaning arguments over that are really only relevant to England. It is also very likely that the seat count in Scotland won’t change hands much. At the moment the SNP have 54 seats, with Labour, Conservatives and Lib Dems all having one seat each. There are two independent MPs, who were both SNP before having the whip withdrawn for alleged financial improprieties. The 2016 Scottish Assembky elections saw the Conservatives climb to second place in terms of seats in the Assembly. However, that election is held using a different election system, which is Additional Member System (AMS). This is a ‘hybrid’ of traditional ‘Westminster’- like First Past the Post (FPTP) for half the seats with a proportional list type vote for the other half. The SNP completely dominated the FPTP half of the vote, winning almost all the seats. Under AMS, this meant that the SNP were then penalised when the PR List half of the seats were apportioned, giving the Conservatives an advantage there. This is relevant, because the Wetsminster election is entirely FPTP, which means that geographical concentration of votes matters, and the SNP has that. Some commentators think the Conservatives, Labour and Lib Dems might sneak a few seats back off them. But others think they could even possibly completely clean up and have a full house of all 59 Scottish seats. Tory David Mundell and Lib Dem Alistair Carmichael have majorities of fewer than 1000 votes for instance. This election might not have happened without Nicola Sturgeon, the SNP leader, who will not be standing in it. She taunted Theresa May last month when legislation passed in Scotland for a second independence referendum about the latter’ slack of any sort of mandate. Sturgeon will see the retention at least of the SNP’s seats as another mandate for her to push for a second referendum. In fact, her ideal result would be a Tory landslide elsewhere, allowing her to point out to the Scottish people that without independence they will have five more years of Tory rule. The Scottish people seem to have decided that, regardless of whether they want independence, they are comfortable being ruled by the SNP. They know that the SNP will put Scotland first and that matters to them at the moment. So, unless all the other parties join together in a pact not to stand against each other (unlikely), then you can expect to see the SNP have a similar number of seats after June 8th, with the Conservative, riding on the back of their ever more popular leader Ruth Davidson (who won’t be standing in this election) getting more votes than Labour. I still feel that most of the Scottish people continue to confuse Scottish nationalism and Scottish independence. Your previous blogs have highlighted the fact that an independent Scotland would be financially crippled by the SNP election promises (even assuming the most positive of prospects for the North Sea Oil) without the financial support of Westminster. 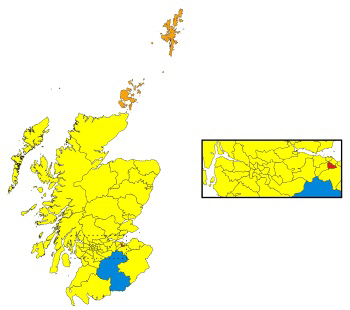 What the SNP can provide is an interesting bloc of seats/power within Westminster and if they could potentially form a workable coalition with the Lib Dems and Labour then perhaps Westminster might have a meaningful opposition? !